You might think we’re mourning the loss of 2014, what with the severe lack of colour in our latest Be An Athlete ‘look of the week,’ but things couldn’t be further from the truth – 2015 is set to be our biggest year yet, and we certainly have a few surprises up our black, black sleeves. The reason we’ve selected the notorious ‘non colour’ with which to start the year, is because black is always ‘the new black.’ It’s timeless, and so when a new year does arrives, and everything’s up in the air, it's always a safe bet. 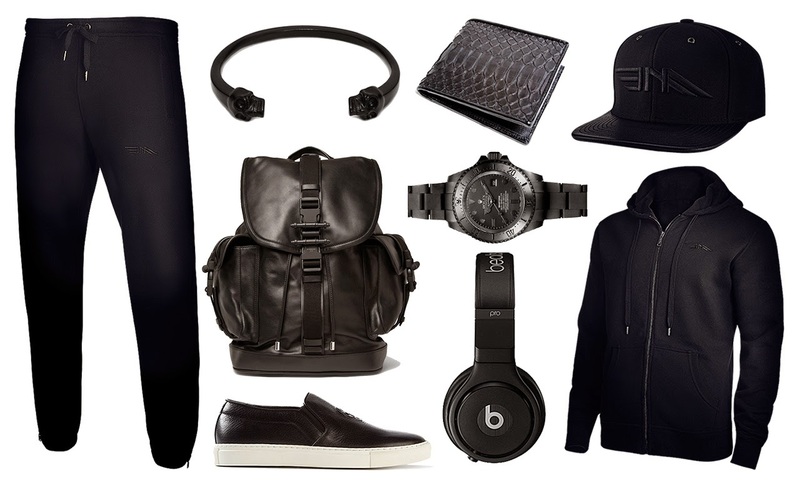 This premium ‘black on black’ ensemble shows off a more ‘urban-luxe’ side of Be An Athlete, that breaks free from the confines of the gym and escapes onto the street. As usual, we’ve put together a few of our favourite luxury brands in order to create a look which is sleek, contemporary and extremely dangerous to go running in after sundown! Sleek and sophisticated, but with a gothic edge, the Alexander McQueen Twin Skull Bangle is made from matt black coated brass with the brand monogram embossed underneath. Dead cool. Backpacks are enjoying a renaissance in the fashion world right now, and there aren't many designs more stylish than this gorgeous offering from Givenchy. Italian craftsmanship, coupled with buttery calf-hide leather, and enough buckles and compartments to ensure you're never jealous of a lady's handbag again! Like our Premium Bottoms, these sneakers from Alexander McQueen combine comfort and style to great effect. Just imagine pulling this bad boy out every time you go to pay for a latté. Finished in genuine python leather (not even your standard adder here! ), you'll be burning through your bank balance purely for the opportunity to flaunt it again, and again...and again! As Christian Bale famously said as Batman, 'does it come in black?' As far as Batmobile Tumblers were concerned, the answer was yes, but had the Dark Knight been asking after a Rolex Deepsea chronometer, it would have been a resounding no. Luckily, the clever guys at Bamford have since produced this customised beauty. Designed to make your music sound the way it did when originally recorded, these monsters from Dr Dre are for those who take their gym playlist seriously. And if our caped crusader was impressed by the watch, he'd be over the moon with these, as they're also 'practically indestructible,' thanks to an aluminium gunmetal frame. Channelling the current 'sports luxe' vibe, the Be An Athlete Leather Premium Cap oozes urban sophistication. And with it's understated 'black on black' branding, it will look just as good with your gym kit as it will with your monkey suit. You've got the headphones, now you just need the integrated, media player pocket compartment and hidden headphone eyelet. Fortunately, our Premium Hoody has exactly that! It also happens to be insanely comfortable with the luxury brushed cotton composition and double layered hood. Absolutely love this! Especially the Alexander McQueen bangle and Be An Athlete hoodie - winning combination. Nowadays, atheletic wear has become very trendy and various top brands are coming out with new clothes in their collection to atrtract the customers. The be an athelete company has come up with its latest black on black range of fashionable atheletic wear. The range consists of tracksuit bottom, twin skull bangle, leather backpack slip-on sneakers, skin wallet and many other items. Moreoever, gone are the days when atheletic wear was all about sports and sportpersons. Many people are actively wearing these clothes due to their comfortness and stylish looks.